Murder by Gaslight: She Didn’t Do as He Wished. Police went to the Bucks’ residence and found Fred Buck’s wife, Julia, in the bedroom, lying face down in a pool of blood. He had shot her in the temple at such short range that the bullet went straight through her head and was found embedded in her hair, which she wore knotted in the back. A second shot he fired in her back had been unnecessary as the first shot had killed her instantly. Fred Buck was the Illinois State Game and Fish Warden and had been in charge of the government aquariums in the Fisheries Building at the World’s Fair in Chicago. He was also engaged in the manufacture of a patent lantern and had previously been a private detective. His wife Julia, 30-years-old, was the brother of Theodore F. Swan who owned a large department store in Elgin. Both Fred and Julia were previously married and divorced. Julia’s mother could think of no motive for the murder. She conceded that her daughter had been somewhat eccentric but did not believe that she was guilty of any serious crime. Others saw the marriage differently; though both had come from well-known, prominent families, Fred and Julia were not considered to be particularly compatible. At the time of his arrest, Buck said that his wife was better off now, she had been living contrary to his wishes, and he had to stop it. Whatever it was that triggered Fred Buck to shoot Julia was never revealed. Fred L. Buck was indicted by the Kane County grand jury in February 1894, for the murder of his wife. He was held in the County Jail until his trial the following January. His plea was guilty, and he was sentenced to twenty-five years in the penitentiary. Throughout his time in jail, Fred Buck maintained a morose silence; he was resigned to his fate and said he did not care to see the world again. “Both Held for Murder,” Kokomo Daily Tribune, February 15, 1894. “Deliberately Murdered His Wife,” The Scranton Republican, November 27, 1893. “Didn't Do as He Wished,” The Times, November 27, 1893. “He Shoots His Wife,” Chicago Daily Tribune, November 26, 1893. 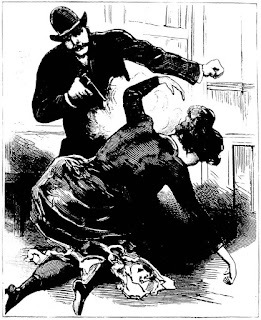 “Murdered by Her Husband,” National Police Gazette, December 16, 1893. “Shot and Killed his Wife,” Princeton Bureau County Tribune, December 1, 1893. “Twenty-Five Years for Wife Murder,” Daily Inter Ocean, January 9, 1895. Same economic levels don't necessarily equate for a happy marriage. This is so sad, who knows what really went on in that marriage? At least he surrendered. Crazed people in every era. "His wife Julia, 30-years-old, was the brother of Theodore F. Swan who owned a large department store in Elgin." You mean she was the sister.